Social network services can help streamline their web content and advertisement space in order to increase revenue from online customers with this free, printable business plan. Introduction: If you are a baby boomer and want to come along for the booming party, join me here and we will have a blast. COMPANY NAME supplies their followers with real life information for those that are approaching or are older than fifty years old. 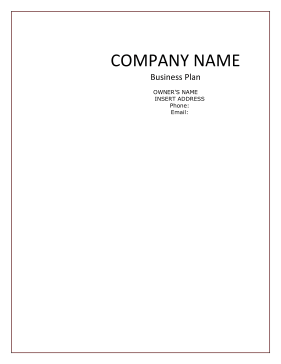 The Company: COMPANY NAME was conceived to share information on booming through the ages after 50. INSERT NAME wanted to take all baby boomers on the trip and have a blast. They will have fun reminiscing! and learn new things. COMPANY NAME will share experiences. Together they will learn how to take care of our old person suits while booming and blasting your way past fifty. This website/blog spot will seek to serve a niche market of those looking to take a ride into retirement. Our Services: Services for COMPANY NAME is simple; they post web content for their viewers and sell advertisement space to those companies looking to reach a niche audience of individuals approaching or have past the age of fifty. The Market: Social media gets a lot of discussion and even a lot of participation from marketers, but in most cases budgets remains low. One reason for the reluctance to invest more is the old problem of ROI, Return on Investment. While some marketers have created successful social media campaigns that they feel they can measure and determine a benefit from, many have still not solved the social success equation. Fame, as well as more monetization options/potential for your blogs, goes alongside personal satisfaction. Another advantage is that big blogs usually market or promote themselves automatically once a certain level of fame has been achieved. Financial Considerations: The current financial plan for COMPANY NAME is to obtain grant funding in the amount of $300,000. The grant will be used to expand their market share, purchase equipment, and hire an employee. COMPANY NAME will also use the grant funds to begin an intense marketing and advertising campaign starting in 2011. A portion of the grant funds will be used to hire 1 new employee. This increase in employees will allow COMPANY NAME to give more personal attention to current clients as well as have the capacity to add new clients over the next 3 years. Without the grant funding it will make it almost impossible to add the additional employees that are needed to increase market share for COMPANY NAME. We deliver the type of content, interaction, and service that our customers demand. 1. Maintaining a reputable and untarnished reputation in the community.